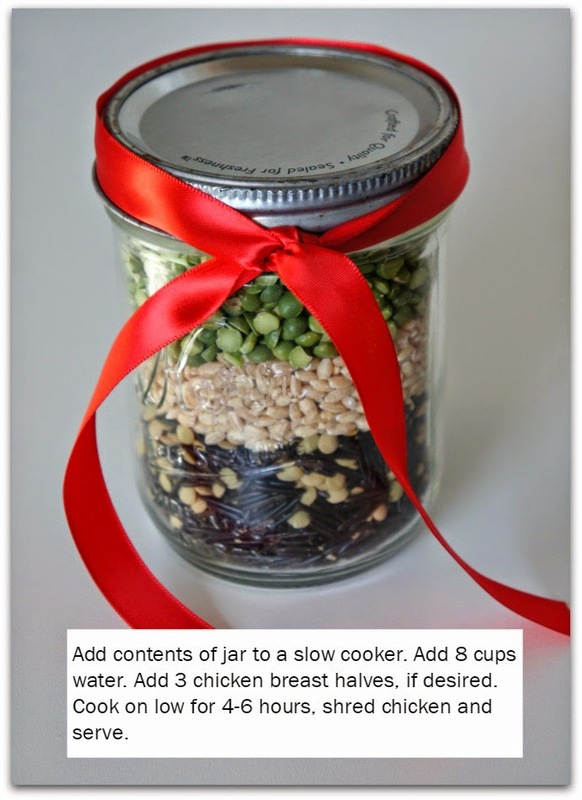 Instead of cookies, mix up your edible hostess gifts this year and try this homemade soup mix in a jar. It’s easy to make and budget-friendly, too. Your giftee will love how easy it is to make the soup. Just add water, chicken, and the contents of the jar to the slow cooker, and you’re all set. Every year around the holidays I receive a lot of sweets from neighbors. Don’t get me wrong, I love sweets, but when the new year rolls around, it’s fun to give and get something other than cookies and candies. This homemade soup mix in a jar is really easy to put together and can be made whenever they want (it’s not perishable). It is so tasty…and healthy! My family loves it. You’ll just need a few ingredients and a jar to get started. Some of these ingredients you may want to purchase in the bulk bins of your grocery store. Others you may already have on hand! 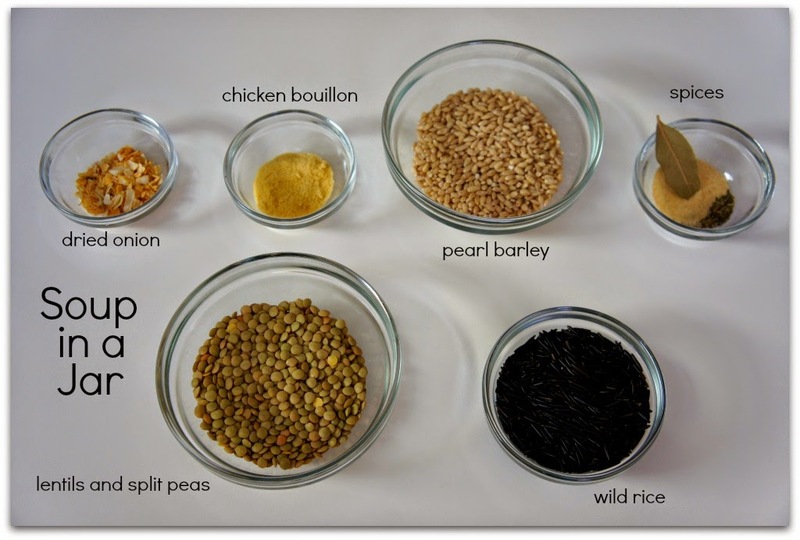 To make this soup in a jar I used dried onion, chicken bouillon, pearl barley, lentils, split peas, wild rice, bay leaf, basil, thyme, salt and pepper. I layered the ingredients in a pint-size mason jar, added a red ribbon, and bada-bing bada boom… it’s done! You’ll definitely want to leave instructions on how to make the soup with the jar. Make a hand-written note, create something cute on your computer, or use the label below. It’s up to you. To use this label on the top of your mason jar lid just right click on the image and press “copy image.” Paste the image into a Word document and resize to the size or your jar lid. Print the label and cut out. Paste on top of the jar lid. If you're burnt out on handing out holiday sweets, try this healthy and savory idea instead. Step 1: Add ingredients in the order listed into a pint size mason jar. I used a funnel to help with this part. 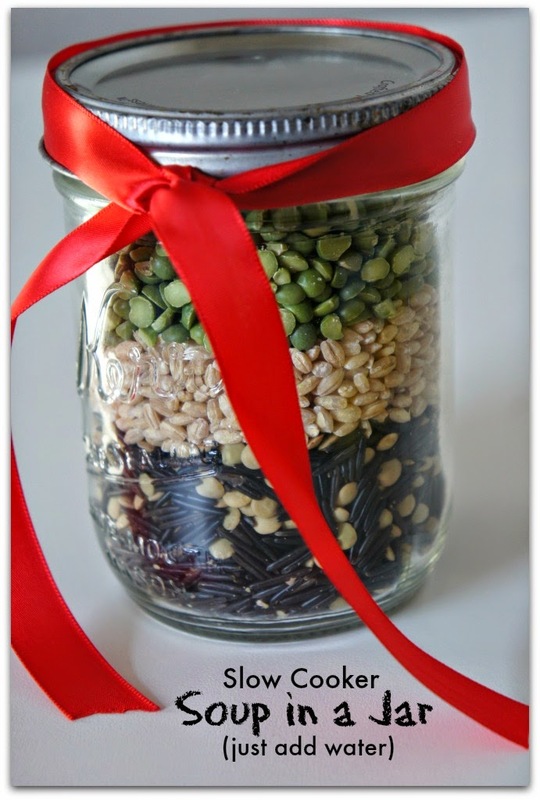 Step 2: Put the lid on the jar and decorate with a bow or ribbon. 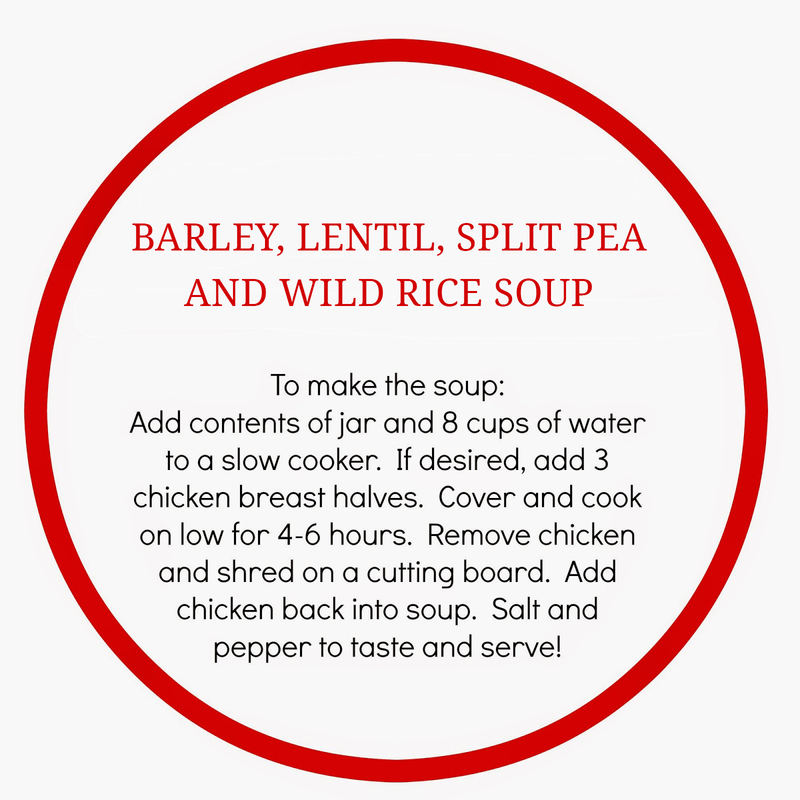 Step 3: Include a label (your can use the one above or make your own) on how to make the soup and give the jar away as a Christmas gift. The label should read similar to the printable label above. Step 4: Add contents of jar and 8 cups of water to a slow cooker. If desired, add 3 chicken breast halves. Cover and cook on low for 4-6 hours. Remove chicken and shred on a cutting board. Add chicken back into soup. Salt and pepper to taste and serve!